International Review of Cell and Molecular Biology, Volume 337 reviews and details current advances in cell and molecular biology. The IRCMB series has a worldwide readership, maintaining a high standard by publishing invited articles on important and timely topics that are authored by prominent cell and molecular biologists. 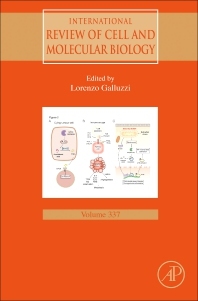 Sections in this new release include the karyosphere (karyosome) and its peculiar structure of the oocyte nucleus, organoids as models of disease, lipid droplets as organelles, the dark side of apoptosis, interconnections between autophagy and secretion, and the regulation and function of intracellular pressure in cell biology. Lorenzo Galluzzi (born 1980) is currently Assistant Professor of Cell Biology in Radiation Oncology at the Department of Radiation Oncology of the Weill Cornell Medical College (New York, USA), and Honorary Associate Professor at the Faculty of Medicine of the Paris Descartes University (Paris, France). Prior to joining Weill Cornell Medical College (2017), Lorenzo Galluzzi was a Junior Scientist of the Research Team “Apoptosis, Cancer and Immunity” at the Cordeliers Research Center (Paris, France; 2012-2016). Lorenzo Galluzzi did his post-doctoral training at the Gustave Roussy Cancer Center (Villejuif, France; 2009-2011), after receiving his PhD from the Paris Sud University (Le Kremlin-Bicetre, France; 2005-2008). He is also Associate Director of the European Academy for Tumor Immunology (EATI), and Founding Member of the European Research Institute for Integrated Cellular Pathology (ERI-ICP). Lorenzo Galluzzi is best known for major experimental and conceptual contributions to the fields of cell death, autophagy, tumor metabolism and tumor immunology. In particular, he provided profound insights into the links between adaptive stress responses in cancer cells and the activation of a clinically relevant tumor-targeting immune response in the context of chemotherapy and radiation therapy. Lorenzo Galluzzi has published more than 350 scientific articles in international peer-reviewed journals. According to a survey published by Lab Times, he is currently the 6th and the youngest of the 30 most-cited European cell biologists (relative to the period 2007–2013). Lorenzo Galluzzi currently operates as Editor-in-Chief of three journals: OncoImmunology (which he co-founded in 2011), International Review of Cell and Molecular Biology, and Molecular and Cellular Oncology (which he co-founded in 2013). In addition, Lorenzo Galluzzi currently serves as Founding Editor for Microbial Cell and Cell Stress, and Associate Editor for Cell Death and Disease.